One of the things I like best about streampunk is its versatility. The low-tech setting and Victorian ethos are suitable for everything from historical novels to alternate history, far-future sci-fi to the superhero supervillain pastiche. Some amazing examples of streampunk have even been sneaking into engaging web comics like Skin Horse, Dresden Kodak ­and Gunnerkrigg Court lately, not to mention young adult lit. Philip Pullman’s Golden Compass series and Garth Nix’s Keys to the Kingdom may be the best known examples of the latter, but for straightforward action and adventure, Philip Reeve’s ­Predator Cities Quartet (published as The Hungry Cities Chronicles in the U.S.) are hard to beat, and deserve more attention that they’ve gotten thus far. I’m a middle-aged man who reads young adult SF and fantasy in addition to the normal adult mix. Blame J.K. Rowling for that. I enjoy the writing, general lack of romantic entanglements, and (dare I say it) the wholesomeness and uncomplicated nature of the characters. But like the best books, they nonetheless take on mature concepts like death, murder, and betrayal, filtering them through the less-jaded sensitivities of teens and tweens. That’s not to say that the characters, including the kids, can’t be bloodthirsty. Take Hester Shaw, the disfigured co-protagonist of ­Mortal Engines, the first Predator Cities novel. For most of the novel she’s pure revenge, forged in the fires of betrayal and a hardscrabble life, and has dedicated her life to killing Thaddeus Valentine, the Head Historian of London. Why? Because he murdered her family seven years before to get a rare “old-tech” artifact that her mother had unearthed in the Dead Continent of North America. It was he who disfigured her in a failed attempt to kill her when she was a child. Ironically, the woman he stole the artifact from was his former assistant, and Hester might be his child. 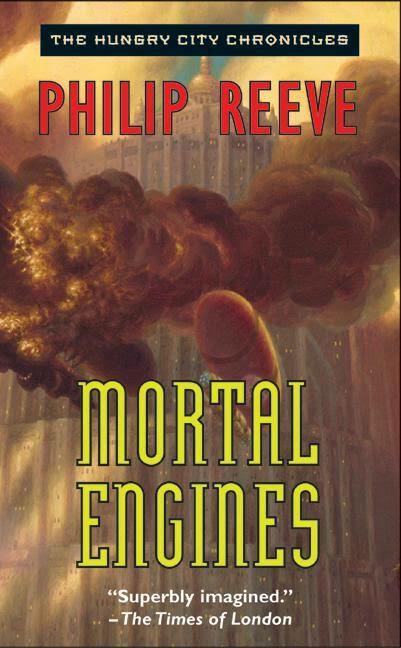 Mortal Engines is set thousands of years in the future, long after “The Sixty Minute War” rendered America sterile. This may have occurred well after our time in Reeve’s chronology, since Twenty-Fifth and Forty-Third century artifacts are mentioned at various points. Very little is directly manufactured anymore—nearly everything is repeatedly scavenged, reused, recycled, recast, and repurposed. The villages, towns, suburbs, and cities of this future are vast, multi-tiered conurbations equipped with wheels, tracks, and engines that have them constantly on the move, searching for and literally devouring each other for materials. The lack of readily-available resources after the War, and a growth of the Ice Wastes to north and south due to subsequent climate change, has forced the cities to adopt “Municipal Darwinism,” a social and religious practice whose founder has been elevated to godhood. Hester’s quest leads her to London’s Gut, where a town is in the process of being dismantled and its people enslaved. It’s there that her fate crosses that of Tom Natsworthy, a 15-year-old historian with stars in his eyes. He follows Valentine and his daughter, Katherine, around the Gut as Valentine oversees the dismantling of the town. After a brief scuffle in which Hester identifies herself, she escapes London through an exhaust chute—and because Tom heard her name, Valentine pushes him down the chute to his expected death. Tom knows immediately what happened, but spends a good portion of the novel struggling to understand why his hero would do such a thing. Even when Hester tells him what happened to her family, he doesn’t want to hear it. They’re quickly separated from London as it roars away, and seek refuge in the wilds of The Great Hunting Ground, as Europe is now called. London steams eastward to menace the stronghold of the Anti-Tractionist League, who hate the “Traction Cities” and prefer to live in “static” communities protected by the great wall of Batmunkh Gompa in the foothills of the Himalayas. Tom considers the Anti-Tractionists a disgusting perversion, and wants nothing to do with them. In their struggle to make it back to London, Tom and Hester hop a small Traction village only to be enslaved; secure transport on Anna Fang’s airship Jenny Haniver; travel to Airhaven, a town supported by gasbags where airships congregate; escape in a balloon after an attack; get shot down by a London airship; end up in pirate town that’s determined to take over Airhaven; are repeatedly menaced by the brainwashed cyborg Grike (Shrike in the original British editions), who raised Hester after her disfigurement but is now a tool of London’s Lord Mayor; and become deeply entangled with the Anti-Tractionist League, through no intentions of their own. This slim novel is a thrill-a-minute, and Reeve does an excellent job of sketching a unique future or a type rarely foreseen, placing it square in the middle of the continuum of Utopia to Dystopia where “weird and wonderful” dwells. His world is neither Heaven nor Hell, it just is; and while often barely recognizable, some parts of it aren’t terrible places to live at all. The concept of Municipal Darwinism isn’t something that would occur to the average writer, which makes for much of the particular genius of this series. And remember, it is a series; Tom and Hester don’t just fly off into the sunset. Well, actually they do, but not forever; and not before Tom sees through Hester’s damaged appearance, and love blossoms. Though some major characters die along the way, Tom and Hester survive for new adventures, while new characters pop up later on “in the most delightful way,” to quote Mary Poppins—including Tom and Hester’s daughter, Wren. You owe it to yourself to have a look. Goggles down, second star to the right, and straight on ’til morning!